A Gentle Giant Sculpt! 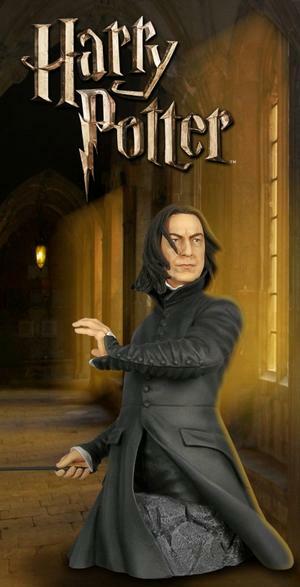 The Half-blood wizard, Professor Severus Snape, a former Death Eater, was not only a Potions master, he also became the Defense Against the Dark Arts professor, as well as the Headmaster of Hogwarts School of Witchcraft and Wizardry. Snape played an important role in the war against Voldermort, though he did so covertly and at great personal risk. Harry Potter author J.K. rowling has singled out Snape as one of her favorite characters to write, and is definitely a fan favorite as well. 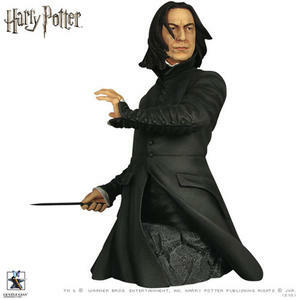 This expertly crafted 1:6 scale mini bust features a finely detailed costume and wand. hand painted and standing roughly 6" tall, this Harry Potter collectible comes individually numbered with a matching certificate of authenticity.